I’m not sure how I feel about this either. I think the site and idea behind is it a cool idea, throwing the issue of identity fraud on the internet out the window. No one has to pretend to be something that they think the internet world would rather see them as. They can just relax and be themselves when communicating and interacting with someone. I like the anonymity that this site creates and the way that it promotes everyone to be themselves but lets be honest, just because the pictures and names disappear doesn’t mean that users are going to be honest. In this day and age, it feels as though it is rare to find someone being truthful on the internet. Using the internet and being able to create a profile on any social media website is something that many take advantage of because they are given a blank slate. They are not given the chance to create any person that they would like, whoever they would like themselves to be which most of the time ends with them not being honest to the internet community. I don’t know whether this site will help the whole false identity issue but it will give the chance for internet users to communicate in a social manner. This site to me comes off as a little creepy, not allowing you to see who you are talking to but who knows, it just might end up being successful. WOW! I must agree with both of you, originally when I read what this website did I was a little weirded out. I do not know if I would be interested in talking to people without knowing who they were ( or thinking I knew who they were) but in reality it could actually be interesting not to have any labels, names, or pictures. I think you described it perfectly as “an anonymous version of Twitter and Facebook combined.” The more I learn about the power of anonymity on the internet, the more I am intrigued by it’s power. Being able to choose when and what you share is a pretty cool concept and allows people to reveal themselves only when they feel comfortable, which I can understand might be a huge relief for some. However, I do not think it will totally eliminate the harassment and bullying ( trolling if you will) that happens on the internet because form what I can see you can still direct your comments towards someone’s number, but I do think it may hurt a little less if the only thing they can attack is a number. Being able to anonymously comment on any topic I find interesting would be something very cool to get involved in and may give me the chance to discuss my guilty pleasures, like the Harry Potter novels. 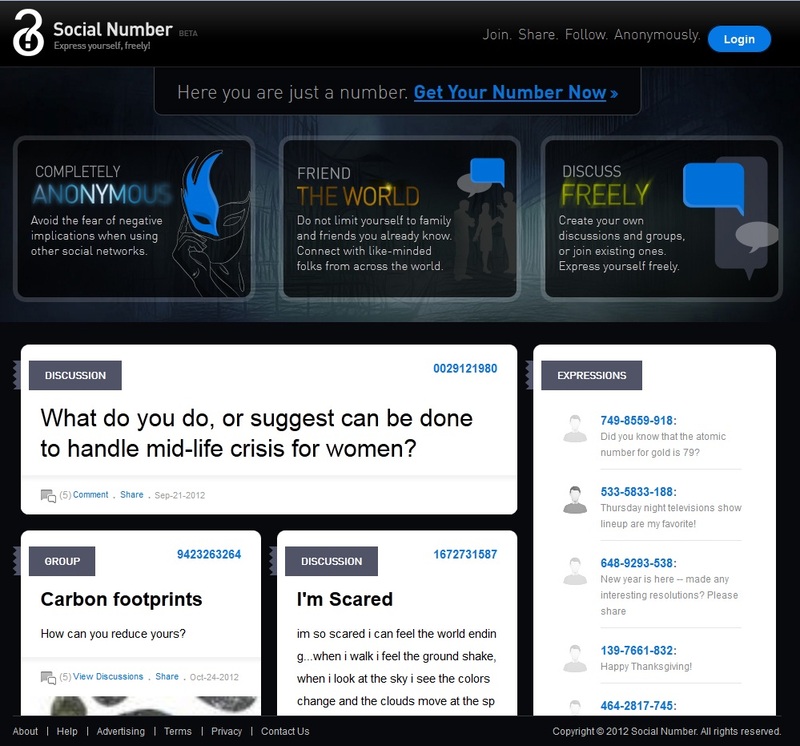 Overall, I think this website is a really cool idea because it is so supportive of anonymity. I am really happy I read your article and you introduced me to it, thanks! Unfortunately, as great of an idea as this is is falls under the same category as communism in that on paper it is perfect, but in reality can just not work. I would hope that people on this site aren’t as masked as on any other regular social media site. I think what I deducted is right in that this site should be used to get out those feelings and things people want to say but can’t to the ones that they already know because of the fear of rejection. On this site it shouldn’t be an issue, it is simply one person talking to another. Nothing more, nothing less. That’s what I would want to get out of this because everybody needs to vent every once in a while, but not everybody gets a chance or has someone they can actually talk to about everything. If only.